thanks for your great and informative comments on the last post! i agree with all of you that i now only buy books when i know i’ll use several patterns in them, or when they have information on techniques i want to learn, inspiration or, for me, historical information. there seems to be no shortage of books that provide one or several of those for me, so i continue to buy books. i also subscribe to interweave knits and spin off, although mostly for the articles. my brain is slowly reconfiguring to imagine a world where individual patterns may be a big part of my library. i think i most appreciate that by buying individual patterns i am 1) giving money to the actual person who wrote the pattern and 2) i have so much more control over what we get for our $20-25 and if i don’t have that much? i can spend $5 and start my project immediately. p.s. remember the pattern i found on the floor in my yarn room? well, sarah apparently could not resist the lure of pattern minus picture and worked up the little christmas stocking while in a waiting room! you can see it here. she also corrected a couple of lines that were wrong. thanks sarah! you’re awesome. This entry was posted in knitting, patterns by cosymakes. Bookmark the permalink. I’m eyeballing the twined knitting book with jealousy :) I’m working on a two ended knitting design now and am reading what I can get my hands on – let me know if you like it/it’s a good reference! I saw a very clever way of dealing with all the individual patterns, magazines, etc. that one amasses (one, not me, surely!) on someone’s blog, I regret that I don’t remember, but they had their magazines bound. I thought that was such a great way to protect them and keep them organized – keep thinking I need to look into that at some point. For now my binder will suffice for the individual ones! The mitten book seems interesting to me. I am a novice at stranded knitting and have recently just started knitting a pair of mittens. And am looking for resources to build up my skills! 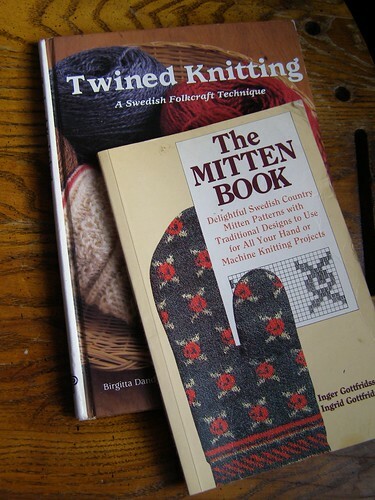 I love books and especially reference books, so my knitting book library is growing all the time. I have found that I especially like books that give the history of a style or method of knitting as it makes me feel so connected to the generations of people who have used those methods. Your new book looks like a great one!